You are here: Home / Health / Grilling for a Healthy Heart. Grilling for a Healthy Heart. (ThyBlackMan.com) According to the American Heart Association, heart disease is the leading cause of death for all Americans. Unfortunately, as stated by the association, African Americans are even more at risk for cardiovascular issues. Maybe you have been diagnosed with either high cholesterol or high blood pressure, or both even. If this is the case, you have likely been warned that these conditions must be addressed to avoid further health problems. You may realize a lifestyle makeover is in necessary, but you don’t know where to start. We all know that to avoid or improve cardiovascular disease we need to exercise regularly, manage stress and watch what we eat. The problem is that sometimes we equate healthy eating with a boring, restrictive, and complicated diet. It need not be so. The easy to follow DASH Diet, promoted by the NHLBI (National Heart, Lung, and Blood Institute), can do much to help ease the transition into a healthier lifestyle. The DASH Diet is very simple. Basically, it advocates focusing on eating fruits, vegetables, whole grains, low-fat dairy products, fish, poultry, beans, nuts and healthy vegetable oils. It also stresses the need to limit sweets, and to avoid foods high in saturated fats. These guidelines are not too restrictive and even make it possible to continue eating the foods we love. However, a few modifications may be needed to prepare meals that are heart-healthy. For example, instead of pan-frying in butter or deep-frying, it is best to switch for cooking methods such as stir-frying, broiling and outdoor grilling. Outdoor grills are a particularly interesting option for those who want to eat healthier. Not only can grilling help you cook with a minimum amount of fat, but it can make foods taste extra flavorful. Meal preparation becomes a fun, relaxing event where the whole family can pitch in. 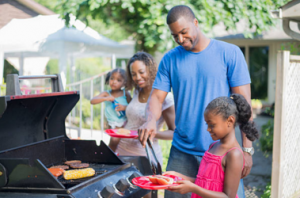 Best of all, outdoor grilling can be done year-round with the help of a gas, charcoal or pellet grill, thus prolonging that wonderful summertime feeling. Though grilling is a wonderful way to cook wholesome meals, it is important to note that certain precautions are needed. According to the USDA, charring must be avoided, and foods must be cooked to appropriate temperatures. Manufacturer’s cleaning and operating instructions must be carefully followed. Tackling cardiovascular disease may seem overwhelming at first, so it is important to take things one step at a time. Focus on making better food choices and using healthier methods for meal preparation. You will eventually reach your health goals, resulting in a healthier mind and body. Improving heart health is indeed a lot of work, but it is well worth the effort not only for yourself but also for those you love!